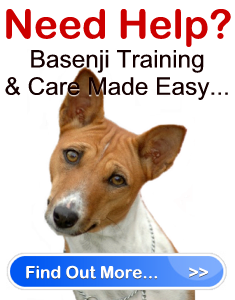 Basenji Care Made Easy " "
The active and athletic Basenjis are a delightful, healthy breed. They make great companions and are very charming and playful. Before owning a Basenji, one must know proper Basenji care which includes grooming, exercise, health monitoring, and training for the over-all well-being of the potential new pet. Basenjis have fine, short-haired coats and shed little to none, making it a suitable breed for those with allergy problems. Grooming is very manageable and low maintenance, as Basenjis clean themselves with their paws like cats, making baths less frequent. However, occasional brushing with a coarse rubber brush is a must to remove dead hairs. And just like any breed, do brush the Basenji’s teeth regularly, as well as trim toenails every 10 to 14 days. As a highly energetic breed, Basenjis need a lot of space to move freely in. They can live in limited space such as apartments as long as they they are brought outdoors often. They need daily exercise such as a long walks, or simply playing games with them. It is not recommended to leave them alone at home for long periods as they are curious and will do anything – it is best to dog-proof your house and remove any hazards. The Basenji do not bark, but can howl very loudly when left alone. Do give them lots of toys to chew on. Basenjis are relatively healthy, but they are still susceptible to many health complications, most especially to a kidney disease known as the Fanconi Syndrome, which can be identified if the Basenji is drinking unusually excessive amounts of water and urinating more frequently. Many Basenjis also suffer from PRA (progressive retinal atrophy), hypothyroidism, IPSID (immunoproliferative systematic intestinal disease), and HA (hemolytic anemia). A huge part of Basenji care is to have regular visits to the veterinarian. Basenjis are also sensitive to household chemicals which can cause liver problems (never bathe a Basenji with human shampoo or soap! ), so owners have to be careful on where to place some household items like cleaning detergents, etc. The Basenji are an independent breed. They tend to please themselves and are known to be mischievous, so it is necessary to train them consistently early on for them to behave well as they grow. Treats are recommended to encourage them to do what they are told. Basenjis also have short attention spans and get bored easily so a variety of training techniques are a must.